I started wearing glasses when I was five, because I had amblyopia. The amblyopia - lazy eye - was treated with patches and exercises and bifocals. Imagine, bifocals on a five year old. My peers always thought my glasses were broken. My mother has always been anti-frou frou, anti-pink, anti-rhinestones. She dressed her two girls in blue (and her boy child as well). When it came time to go get my first pair of glasses, she took me to the optician in the moderne building in the next town, where they pulled out a tray of child-sized frames. It was divided in half - rhinestone-bedecked pastel cat eyes on one side, sober-looking tortoise shell on the other. My mother picked out a pair of tortoise shell frames and proceeded to get into an argument with the optician. He insisted that "those are for boys, she can't wear those" and tried to force her to buy a pale blue number. My mother won - after all, she was paying for them. I ended up wearing those glasses for four years - they appear in the class photos for third grade, but not fourth. Not long ago, I found a loose photo floating around at my mother's house. In it, I'm nearly seven, my brother was four, and my sister was about a year & a half. And I'm wearing those glasses. These days, I still wear glasses, but I've got a cunning rimless pair that disappear on my face. Over the weekend, I went to the optometrist because I felt like I couldn't see anymore. What did she recommend? Bifocals. I feel like I'm in kindergarten again. And that is such a cute photo. Oh, your mother is AWESOME! That is such a great photo. Is that your sister laughing? Red laughs like that - just full out guffaws. I particularly love her saggy tights. They are either too big or too small always, aren't they? I have an eye appointment tomorrow and am hoping to avoid the bifocal discussion for another year. I have ended up liking my bifocals immensely. red rover, red rover, send Magpie right over . You'll fit right in. (and don't worry, our motto is- we don't say "you can't play." I secretly wished for glasses as a child. I thought they were a terrific accessory. That's great picture. I think that's the cutest picture ever, Magpie! I'm casting my vote for the rhinestones, though today we have nearly the same glasses. I went with titanium frames because they are so flexible. My ears are seriously misaligned and one always hurts with a pair of glasses that has hinges. I love this photo, too. You are adorable and your sister looks hilarious. I so want to know what she's laughing at. Although, my daughter can toss her head back like that and laugh at nothing at all. My mother tried to be anti-pink and anti-sparkle but it didn't work so well. I'm with you on the rimless - they rock. And if you're about to buy a new pair, I just got mine for $20 over at zennioptical.com. No, I don't work for them. It's just I want my fellow glasses wearers to stop paying $400 too. That picture rocks. Your sister's head thrown back, pure madness! Love the photo! My oldest wears glasses, she's five almost six and had them since she was two. I let her pick out her glasses now, always a pair of retro red ones. Never "girly" in appearance. I love that about her! That picture is priceless. And bifocals rock;) So do hot flashes. I like them! My very favorite frames won't fit my bifocal lenses. I'm thinking of getting them re-done. High FIVE! I just found out I need bifocals too. Miss M has been patching and stuff all year and so far has avoided glasses. Now her hearing is on the fritz. I wish I knew what was going on. I'm stuck on the hilarity of the baby. (Hey, I was always invisible to my younger, adorable, cracking-up sisters). Awesome moment captured. you look so damn cute in that photo!! great story, and great photo! you need not worry about the bifocals. the progressive lenses are fabulous -- no line between the closeup and faraway portions, and you will wonder how you did without them. That is a fantastic picture. You were cute, so the glasses looked sweet. One of my sisters has a lazy eye and I remember her going through the whole patching thing. She lucked out and has had great vision in her good eye. My first pair of glasses was bifocals. The optometrist for some reason thought that I would not take my glasses off while reading (I guess he assumed that I was too young). I hated them as they were hard to get used to and I ended up taking them off for reading anyway. They were ugly glasses to boot. Awww... your glasses are CLASSIC!!! and boy! I'm so curious what made your little sis laughed! When I saw that picture, it just lifted my spirit! I wear the progressive lenses -- bifocals without the line. They didn't take any time at all to get used to. But I also have multi-focal contact lenses, which is what I prefer. I wear them most of the day, and the glasses just at night. 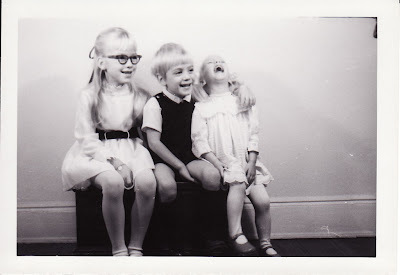 I love your laughing sister - and those were some glasses! I hope to be just like your mother! In some way, it makes you look very stylish. You were ahead of your time. I love that picture. You look like my sister (who wore glasses from a young age). When I was 5, I asked for glasses, braces and brown hair for Christmas. And isn't your new rimless pair made by the same person who made Sarah Palin's? There's something about little kids in glasses that just gets me right in the heart! Now that's not typically what you hear about bifocals! Very cute. My dad is a retired optometrist and one of my favorite things about a visit to his office was trying on the glasses! It makes me feel old to say it, but I love my no-line bifocals. And I only felt like throwing up for a couple of days. that picture is so awesome. i'd blow it up and hang it. I've got a lazy eye too!!! I WORE BIFOCALS IN KINDERGARTEN!